Portland, OR – Schiller and Vroman, Inc. is the recipient of the Signatory Painting Contractors Organization (SPCO) Annual Contractor Safety Award. The award was presented at the annual Safety Meeting. Criteria for the award was based on 2017 job-site safety records, corporate safety programs and participation in the OSHA approved SPCO joint Safety Committee. 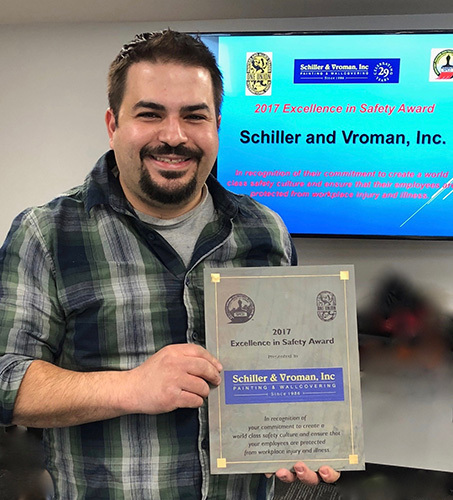 Receiving the award on behalf of Schiller & Vroman, Inc. was Dominic RJ a member of the Schiller & Vroman, Inc. safety team. Schiller & Vroman, Inc. is a commercial painting contractor owned by Steve and Robert Schiller. The company has been in business since 1986. Steve Schiller is an original founding member of SPCO and served for more than 25 years on the Painter’s Apprenticeship and Training Committee.